Imagine falling right into a book, that sends you off to a magical world of adventure. While reading The Land of Stories: The Wishing Spell by Chris Colfer, that is exactly what I felt. The fascinating book is about twins Alex and Conner who go through a rough time after the loss of their father, the hero in their life. As a result of their father’s death, their grandmother comes to visit. She brings a book that is very special to the family. That book is The Land Of Stories. The setting starts in present time, with Alex who loves to read, and Conner is the cool kid of 7th grade. Alex takes the book that their grandmother brought to their house, for the night in her bedroom. Suddenly, she hears a buzzing noise, and sees a light glow from the book. It pulls her toward the pages. Conner panics and jumps into the book as he is scared for the life of his sister. All he remembers afterwards is screaming for help. The setting then changes to a fantasy world of a variety of princess fairytales. The Land Of Stories: The by Chris Colfer makes you sit on the edge of your chair, while biting your fingernails. This fantasy is definitely on my “favorites” list. This is part one of the trilogy The Land Of Stories. Colfer has a unique way of describing conflict between the twins and the evil queen. In addition, there are many character vs. nature conflicts where the twins have to survive in settings against a pit of thorns, a mine field, and magical stream. I recommend this book to people who love to use their imagination. I can relate with both of the twins throughout the book because of my interest in fairy tales. Chris Colfer is not just an author, but he is a singer and actor on the hit Fox television series “Glee.” Moreover, he said that most of his inspiration comes from his sweet grandmother who was his first editor, always giving him the best advice. 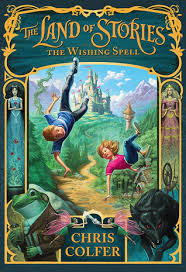 Another sensational and breathtaking book from Chris Colfer, The Land of Stories The Wishing Spell exceeds the readers expectations.